The Irish Correspondence Chess Association (ICCA) became ICCF’s 51st member in 1973, but Irish teams had competed internationally before then. The history of CC in Ireland goes back to the mid-19th century. 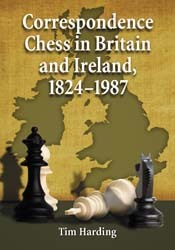 It is detailed in the recent book Correspondence Chess in Britain and Ireland, 1824-1987 by Tim Harding, which also contains much information about the early years of ICCF after the Second World War. The ICCA, which caters for players both in the Republic of Ireland and Northern Ireland, was very active for a decade after being formally reconstituted in July 1995. Unfortunately the growing strength of computers, together with the fact that most of our stronger players have fulfilled their ambitions in the sport, led to decreasing interest. Membership peaked at 90 paid-up players but by 2010 numbers of active players had fallen to about 30, although each year a few new players are attracted by the convenience of the ICCF webserver. There is no longer any formal membership structure as the ICCF direct entry system handles finances for us. Undoubtedly there is a need for a new generation to come forward to take over the Irish CC organisation and recruit new players. There are now seven Irish Senior International Masters and two IMs, all of whom are over 40 years old, but little likelihood of any new players reaching the required standard in the near future. CC in the early 19th century was usually played between clubs and the first known such event with Irish involvement took place in 1841. The small cathedral town of Armagh lost a game to the players of Liverpool in England but then drew a second game. The first Irish postal tournament was played in 1871/2 and Irish clubs played several CC matches against English clubs. It is noteworthy that Dublin defeated Cambridge 2-0 in 1894 despite the fact that the redoubtable H.E. Atkins (later to be British OTB champion nine times) was on the Cambridge team. The development of CC in the later 19th century owed much to the energies of chess journalists Thomas and Frideswide Rowland, who organised numerous matches and tournaments involving players from England, Scotland and Wales as well as Ireland. One of the earliest national CC Championships in the world was inaugurated in 1908 by Mrs Rowland, the first champion being decided in 1910. Although some events took two or more years to complete, there was an unbroken sequence of competitions until 2007 when the organiser of the postal tournaments, Jim Corby, retired. Since then there have been no more internal Irish tournaments because several leading players left the game for various reasons while others prefer to compete only internationally. Belfast-born Alan Ludgate achieved a rare double when, in 1986-87, he won the Irish Championship and in the same year tied for first place in the British CC Championship. A full list of winners appears in the book mentioned above. Irish players, from both the North and South, have long been active in British-organised events such as those of the British Correspondence Chess Association. Both John P. Griffin (Dublin) and W. Desmond Taylor (Belfast) have won the BCCA championship. A Dublin-born First World War veteran turned Benedictine friar, the Rev. C. Basil Whelan (1896-1986), was one of the B.C.C.A.’s chief organisers between the 1940s and 1970s. Between 1925 and 1928, Ireland played a friendly postal match of 14 games against the Correspondence Chess league of America, narrowly won by the Americans. Two major matches were played in the 1920s and early 1930s between Ireland and the BCF, with only narrow victories for the English. In 1927 Ireland played a friendly over 50 boards against Wales. So great was the entries that a draw had to be made to select the team. Ireland competed in two sections of the first post-war Olympiad, with John C. Hickey (Templemore, Co. Tipperary) scoring +3 =1 =2 (3½/6) including a win over the Swiss master W. Henneberger. Hickey won the Irish CC Championship four times but he emigrated to Singapore in 1949. So the country lost its leading player and in the 2nd CC Olympiad, Ireland finished last in its section. After this, Irish participation in ICCF events ceased for two decades until the 1st European Team Championship began in the early 1970s; this seems to have been the occasion of Ireland being encouraged to (re-)join the international organisation. Fielding a 12-board team after a 20-year lay-off was hard for Irish players suddenly meeting master opposition, although the nucleus of the squad was a team from Cork, which competed in British team events. Fifty per cent of the Irish points were obtained by just two of the players and on board 1, John M. Murray became the first Irish player to achieve an IM half-norm. Unfortunately John’s duties as a bank official often took him abroad and he was unable to complete his title qualification. Ireland returned to the Olympiads in the 8th Preliminaries. Unfortunately, the Irish participation was badly disrupted by the 1979 Irish postal strike, which lasted several months. We had no team in the 9th Olympiad but, since then, Ireland has competed in numerous team events. Our peak achievement was qualification for the final of the 15th Olympiad. The first Irishmen to win ICCF honours were Tony Doyle (Irish OTB Champion 1975), who gave up CC due to computers, and Alan Ludgate (Irish OTB Champion 1977). The SIM title has also been awarded to Eugene Gibney (who has also won the Canadian CC Championship), Tim Harding, Darrell Nightingale, and Desmond Taylor. Oklahoma-resident Ciaran O’Hare (winner of the 2008 USCF Absolute Championship) will receive this award in 2012; the IM title is also held by John M. T. Ryan and David Salter. Ireland ran one invitational master tournament, in memory of Wolfgang Heidenfeld, the well-known chess writer. A more thorough history of CC can be enjoyed by Tim Harding’s excellent book “Correspondence Chess in Britain & Ireland 1924-1987” published in 2011, and which is strongly recommended (About Tim’s chess history book, Radio interview about book – 29.05.2011).